London 1988: PC Mike Pannett, fresh out of training school, had suspected life in the Metropolitan Police was going to be a bit different from rural North Yorkshire, but the 23-year-old had no idea by just how much. Sent south of the river to Battersea, then top of London’s crime league tables, Mike was thrown straight into the deep end – during his first drugs raid he ended up staring down the wrong end of a double-barrelled shotgun. Mike Pannett was born in York and joined the Metropolitan Police in 1988. 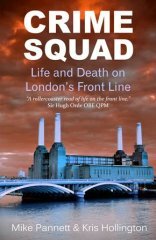 He became one of the youngest officers to be given his own patrol (in one of London’s toughest estates) and went on to serve on the Divisional Crime Squad, Murder Squad and TSG. He has written five bestselling books. Gripping, funny and in places disturbing. I only wish it was longer. Fantastic author, really feel you're there when you read his books, another classic. Great read as always. Tells it as it is! I never hesitate in purchasing any of Mikes books and can not wait for the next! Mike Pannett is a talented author. His tales of his time on the beat are amusing and heartfelt and Crime Squad is an excellent example of this and a great read. Anyone would have been thrilled to have had Mike as their local bobby! Good Luck Mike, an excellent book as ever. I always look out for the mext one! brilliant from Mike as usual. Top read. What an insight. Superb The passion comes through every page. A very compelling and well investigated book..a MUST read!!! Look forward to reading the book..
A brilliant and gripping read. Probably the best book Mike has yet written. Had me laughing out loud .....on a flight from Kraków! Quite a diversion from author's previous books on policing in Yorkshire. This one is about the nasty side of society. Crime Squad, the latest of Mike Pannett's books, is an excellent read. I couldn't put it down. Mike is a great author and Yorkshire lad! A fascinating and gritty book, so well written you feel that you were there with the author!